Samsung chairman Lee Kun-hee took the opportunity at his annual start of the new year speech to address his new focus on where he wants Samsung to go. Lee Kun-hee highlighted that competition is greater than ever, and 2013 only proved this. His vision is for Samsung to forget about old technologies and habits, dropping their current practices, and focusing on innovating around the clock non-stop to come up with new technologies and direction. 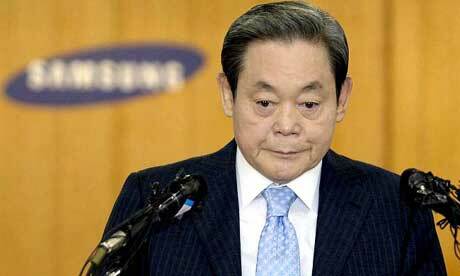 Lee Kun-hee insisted that the research and development department should work around the clock in order to come up with new innovative products in order to get rid of the business models Samsung currently rely on which are from five, ten years ago. He also highlighted that Samsung should remove themselves from their hardware-focused ways, insisting that software is the way Samsung can innovate. The speech comes as investors expressed concerns that Samsung have lost their innovative touch and instead are working on a business model which relies on producing products based on other companies new technology. Though the company are currently the largest seller of mobile devices in the market, their traditional strength has been on releasing hardware and reacting quickly and cheaply to new developments in the market, with their software often taking a back seat. The investors concerns about the state of the future for Samsung saw their shareprice plummet by 10 percent, despite the recent record-breaking earnings results. The concern is not Samsungs current performance, but where the company can go, with investors predicting Samsung’s profit growth will fall to under 10 percent this financial quarter. It seems that Samsung, or at least Lee Kun-hee, want to focus on innovating their own products and coming up with new technologies, with a primary focus on perfecting the software the company offer. Anyone that has used TouchWiz – the skin that Samsung overlay on top of Android – will testify that it’s far from perfect, despite the huge amount of features Samsung bundle with it. Perhaps if Samsung do focus on their own innovation rather than reacting to changes in other products in the market, they may be able to avoid any further lawsuits in 2014. Watch this space.